Choosing the right holiday can sometimes be a difficult task, especially when going with other people, but it doesn’t have to be. If you have one friend who likes culture, one who likes cuisine and the other who likes to get off the beaten trail you might find that it could be a bit difficult to make sure everyone gets a bit of what they want. With a cruise though you can be sure that everyone will have a taste of their individual preferences and then some. But where to go for your next cruise holiday? If you want something a bit new and unusual, why not enjoy a Baltic Cruise. Estonia is one of the most beautiful and engaging of the Baltic countries and for good reason. With an interesting history including occupation by the USSR and a subsequent non-violent independence revolution, Estonia has a rich history that can be explored through culture, cuisine, music and its beautiful medieval town squares such those found in Tallinn, the capital. Beaches are numerous along its extensive coastline, and although the beach season is short, it’s well worth a visit in the summer months to take advantage of the coast. With over 1500 islands to check out and explore as well, it’s easy to see how Estonia can be a great stop for anyone looking for a bit of adventure coupled with history. Latvia is bordered by Russia to the east, Estonia to the north and Lithuania to the south. Home to the capital city, Riga, Latvia has a varied landscape and rich history including a formerly tribal heritage, some of which has been passed down to various regional culture and cuisine, making travelling around Latvia a varied and interesting experience as each area is different. Riga is awash with tiny back streets paved with cobblestones against a backdrop of numerous high steepled churches, making for a beautiful stop for those who love architecture and exploring local cafes to sample regional dishes and beers. A country that is a mix of lowlands, highlands and coastal regions all mixed with forests, lakes, hills and even an area of sand dunes, Lithuania is a great country for the nature lover and those who like to get out and get active. For a truly unique experience visit Lithuania’s Curonian Split – an area of coastal sand dunes with ethnographic villages and seaboard forest. Much of Lithuania is home to truly spectacular natural scenery, along with towns and cities that showcase some of Europe’s most beautiful architecture. Once the largest country in Europe, many monuments still remain to this day to showcase Lithuania’s impressive past. The Baltic nations that can be included in any trip to the region include Finland – particularly the capital city Helsinki, Gdansk in Poland, Stockholm in Sweden and Copenhagen in Denmark. 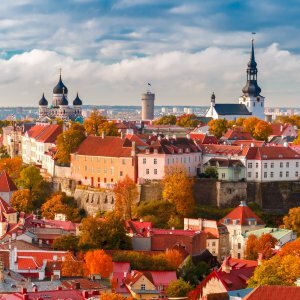 The Baltics (sometimes referred to as ‘northern Europe’) provide a great, unique and highly cultural experience for anyone visiting the region, and with so many different countries to explore in a small area, you can really satisfy the travel bug for awhile. So if you want to go on a truly unique adventure with friends or family, consider a Baltic cruise. There are so many amazing things to see in each port that you will wonder why you didn’t come to the region sooner!